Just another bride...: The Cake! I am truely blessed to have one of the most talented cake artists for an Aunt. As long as I can remember I have had dreams about Aunt Barb making my wedding cake and am so excited for that to finally happen. My problem, how do you decide what you want when you can have anything you could possibly want? 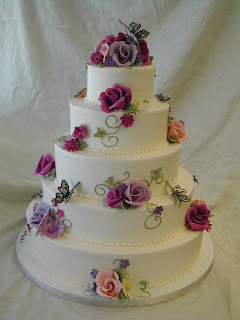 I love the swirls that crawl up the side of this cake and the ribbon along the bottom of each layer. 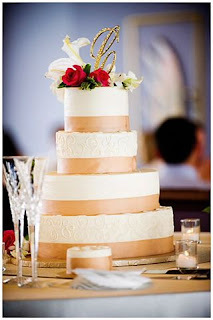 Again, love the ribbon, swirl design on every other layer and the Monogram/flowers on the top. Love the flowers trickling down the side and the swirls. Don't particularly care for the big gold dots though. 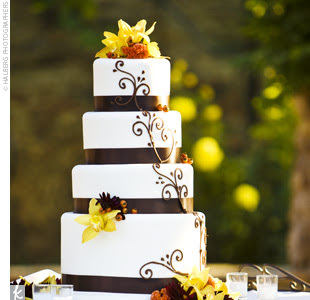 Love the randomness of the flowers on the different layers of the cake. 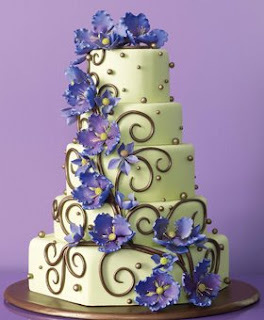 I am so excited to get to sit down with my Aunt at the end of this month to work out the details of the cake.